FAIRFIELD, CT -- The scenic beauty of Fairfield’s precious open space landscapes is the subject of an Aspetuck Land Trust sponsored exhibit of work by local painter Gail Bell at the Fairfield University Bookstore, 1499 Post Road in downtown Fairfield. It will start Friday, August 3 with a reception open to the public from 6 p.m. to 8 p.m. The paintings, on display at the bookstore for the complete month of August, reflect Bell’s impressions of several of the 12 land preserves across some 60 acres in Fairfield owned by Aspetuck Land Trust (ALT) “for the benefit and education of the public,” according to the mission of the Trust. 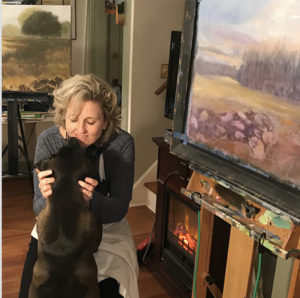 Bell, who began studying ALT’s Fairfield land preserves and creating the paintings in 2017, has agreed to give a 20 percent discount to ALT members and to donate 20 percent of the exhibit’s proceeds to benefit ALT. “I fell in love with this land and I hope the paintings make others feel the same,” said Bell. Since its founding in 1966, ALT properties have grown to include more than 1,800 acres in 149 preserves in Fairfield, Easton, Westport, Weston and other nearby towns. ALT has also said it is targeting 350 acres of unprotected forest land in Weston and Wilton for acquisition. It additionally recently informed its 1,100 members of a larger strategy to create a 17,000 acre greenbelt corridor of adjoining or nearby parcels of open space in the area over the next ten years. “When people talk about the beauty of Fairfield today, whether along the coast, in meadow land or in wooded interior areas, most would agree that it is these large, protected open space vistas that make our towns beautiful. We need homes. We need roads. But we also need to be able to see the beauty of our serene New England landscape to be happy. The beauty of our natural landscapes is one reason local real estate has become so desirable, “said David Brant, Executive Director of ALT. “Gail’s work makes a statement about the importance of land conservation in an area that faces intense commercial and residential real estate development pressure. We believe if it’s worth painting or photographing a landscape, it’s also worth preserving. We are grateful to Gail and to the university bookstore for making this exhibit possible,” said Brant.